Warrington missed out on the chance to extend their Super League lead with a shock defeat at Huddersfield. The hosts came into the game bottom of the table, but took a well-deserved half-time lead when Aaron Murphy went over in the corner. Warrington offered little in attack, and Danny Brough extended the Giants' lead with a penalty and a drop-goal. Leroy Cudjoe's late try sealed the win for Huddersfield, who remain 12th after fellow strugglers Leeds beat Hull FC. Warrington remain top of the league after extending their winless run against Giants to five games, but Tony Smith's side are now level on points with both Catalans and Wigan. Wolves were poor in possession and were perhaps fortunate not to concede more points, as both Joe Wardle and and Oliver Roberts were held up over the line for the home side. 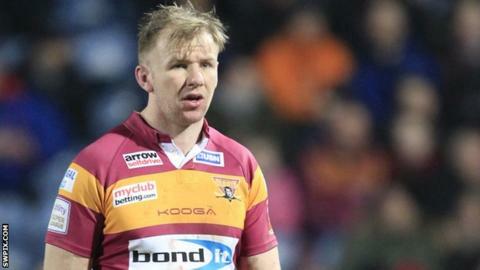 The visitors were able to prevent Jermaine McGillvary scoring for an eighth successive match for Huddersfield, but persistent errors in attack saw them lose in consecutive games for the first time this season. Huddersfield head coach Paul Anderson: "Just the win is pleasing. It was important in regard to where we're at. "But we can't rest on our laurels, we need another 12 like that if we are to give ourselves a chance. "We want to be in the top eight, not the middle eight." Warrington head coach Tony Smith: "It's a concern. We're not happy and we're going to change our training routine. We're going to do things differently. "I thought our defence was terrific but we couldn't match Danny Brough's kicking game. "He kicked us to death twice last year and he was at it again." Warrington: Russell; Penny, Hughes, Atkins, Evans; Gidley, Ratchford; Hill, Clark, Sims, Westwood, Currie, Westerman. Replacements: King, Philbin, Jullien, Wilde.